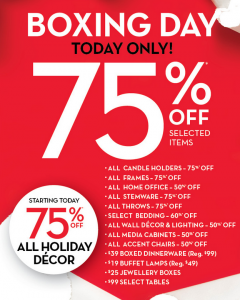 Bombay Canada has released their Boxing Day 2014 sale deals! 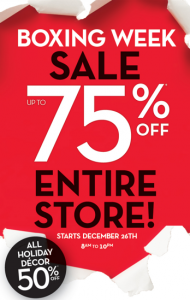 Get up to 75% off entire store! Save 50% off all Holiday Decor! 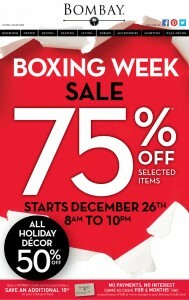 Shop at Bombay during their Boxing Week sales and deals Canada 2013! Sale starts December 26th 8AM to 10PM so don't miss it! Here is more information on Bombay's Boxing Day Sales and Deals Canada 2013.